Matthew Paris (c. 1200-1259) became a monk of St. Albans in 1217, and in 1236 became the abbey chronicler, a task which allowed him to exercise and explore his talents as a scribe, and as an accomplished and inventive artist. Most of this manuscript is written in Matthew's own distinctive handwriting, as are the miniatures, except for some added in the 14th century. Known by Matthew as his 'Book of Additions', it contains a variety of miscellaneous texts and images. The purpose of this drawing of a bird is uncertain; the contents of the rest of the page seem unrelated. 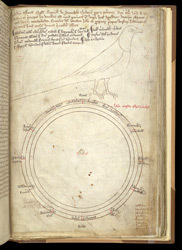 Below the drawing Matthew has written 'Secundum magistrum Elyam de Derham', which may mean that he copied the bird from a work of Master Elias of Dereham (died 1246), whose many achievements include the building of Salisbury Cathedral and the making of a new shrine for St. Thomas Becket.